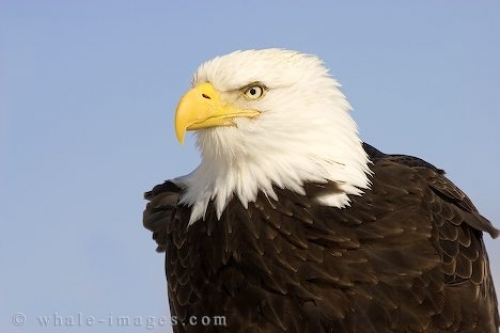 A fascinating American bird of prey is the Bald Headed Eagle found in Homer, Alaska in the USA. The Bald Headed Eagle is the living symbol of the USA's freedoms, spirit and pursuit of excellence in Homer, Alaska and has since become an important part of art, music and architecture. This great bird of prey is highly respected by humans as well as other species of the bird family. The impressive snow white feathers of the Bald Headed Eagle do not actually appear until the eagle is around 4 or 5 years of age as with the exquisite yellow eyes and beak. When a Bald Headed Eagle reaches maturity it can be anywhere from 29 to 42 inches long, weigh up to 15 pounds and have a massive wingspan of 6 to 8 feet wide. Looking at a bald headed eagle of this magnitude makes it hard to believe it was once a tiny gray ball of fuzzy feathers relying only on its mother and father for survival.